With the success of the MiG-29 Izdelie 9-12, the Mikoyan OKB continued adding new capabilities to the 9-12 airframe before transitioning production to the 9-13 (NATO Codenamed: Fulcrum C). There are several variations of the 9-13 but it is visibly recognizable by the enlarged dorsal spine and the ability to carry a wider range of external stores. Great Wall Hobby is a kit manufacturer from China that has been producing a number of great subjects overlooked by other manufacturers. 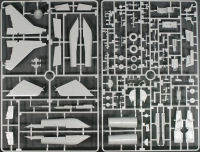 This latest release represents the 9-13 and is the first production kit of this subject in 1/48 scale. The inboard pylons are plumbed for external tanks and are the only stations that are rated for the R-27, so you'll have to choose between fuel or missiles for your inboards. This is the first kit that has captured the centerline tank correctly. On the full-scale aircraft, the only place that the MiG engineers could put an Auxiliary Power Unit was between the engines exhausting downward. The problem with this was that it would exhaust directly onto the external tank. The simple solution was to build an exhaust duct right through the middle of the tank and route the hot gasses out below the external tank and that is captured here. 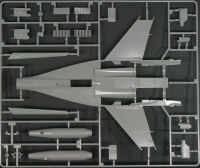 Verlinden was the first aftermarket company to fix this WAY back for the venerable Monogram 1/48 MiG-29 kit. Oh yes, as for the most advanced molding I've seen, take a look at the weapons images that are in the black background above. Somehow Great Wall has managed to mold these missiles with all of the fins in place and even the bow-tie fins of the AA-10s! These look outstanding and thank you for not having to glue up all of those fins! Painting instructions are provided in the new Gunze Creos color standard. 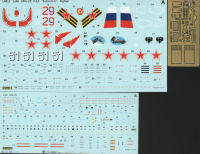 A nice set of airframe and weapons stencils are also provided. 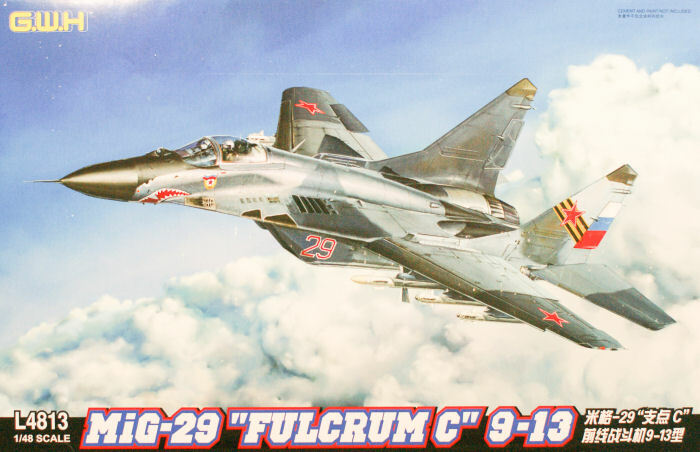 This is clearly the nicest MiG-29 kit produced in any scale to date and I sincerely hope they'll do Izdelie 9-15 and 9-31 in our future. My sincere thanks to Great Wall Hobbies for this review sample!